. We introduced store visits measurement two years ago to help advertisers measure these consumer journeys that span the online and physical worlds. Since then, advertisers globally have measured over 4 billion store visits in AdWords. Today, we’re excited to announce new innovations that will make store visits available to thousands more advertisers around the world. These innovations will also allow us to report more store visits for advertisers already using these insights to give a more complete view of performance. We know measurement insights like store visits help you make business-critical decisions about how you manage and optimize your marketing campaigns. That’s why we uphold strict, conservative confidence thresholds for the data you see in AdWords and only report on store visits when we’re sure the data meets the highest standard of accuracy. This is also done in a secure, privacy-safe way without sharing any personal location information at an individual level. Store visits are calculated based on aggregated and anonymized data from users who opt in to activate Location History. As we continue to evolve our measurement technology with new strides in machine learning, mapping technology and survey quality, we are able to increase the number of store visits we can report while still achieving that same high bar for accuracy you’ve come to expect. In the past month, we’ve upgraded to deep learning models to improve how we measure store visits. We’re now able to train on larger data sets and increase our accuracy in prioritizing which location signals are most predictive of true visits. This allows us to reliably measure more store visits in contexts that are typically tricky, such as in multi-story malls and dense geographies where many business locations are situated close to each other. These are the innovative machine learning techniques at the core of powerful Google features that help people solve complex problems in their everyday lives -- they can help automatically curate images in Google Photos to create an album of your favorite college memories. Or process entire sentences at a time in Google Translate to give you translations that sound much closer to what a fluent speaker would say. We’ve also scaled our efforts to map the precise geography and geometry of more business locations. We’ve refreshed imagery from Google Earth and Google Street View to get the most up-to-date, external views of where different buildings begin and end. Around the world, on-the-ground teams are also partnering with more businesses to scan Wi-Fi strength inside buildings to figure out their true boundaries. When our systems detect that potential visits have occurred, we add an extra layer of verification by surveying select users about their store visits. We directly ask which locations they’ve visited, see how this checks out against our predictions, and then use this data to calibrate our machine learning models. We’ve continued increasing the reliability and quality of these surveys using real-life audits and location visits from our own teams. For example, we’re now verifying more visits that happen in areas with high store densities to give our models more data to learn from. This strengthens accuracy and allows us to report on more store visits that may have been previously excluded. New innovations for measuring store visits will allow more AdWords advertisers to get these insights for the very first time, and deliver a richer and more complete data set to advertisers already using store visits. We’re excited to continue partnering with you to build better online-to-offline experiences for your customers and help you measure the direct impact to your business. When people are deciding where to go—like where to shop, eat or have fun—they turn to their smartphones to explore and find nearby places. We introduced store visits measurement two years ago to help advertisers measure these consumer journeys that span the online and physical worlds. Since then, advertisers globally have measured over 4 billion store visits in AdWords. (DSA) help you reach people who are searching for your products and services—without the need for you to actively manage keywords or ads. Today we're introducing three improvements to DSA: page feeds, expanded ads and quality enhancements. Page feeds give you additional control over your DSA campaigns to ensure only relevant products and services are shown to your customers. Simply provide us with a feed of what you want to promote and select the landing pages that you want to include in your auto targets. We’ll use this information to determine when your ads will show, and where to direct your customers to on your website. You can also apply custom labels in your page feeds to keep your ads organized. For example, create a label called “Holiday Promotion” and apply it to a group of products to easily activate and pause all ads within that promotion at the same time. Mark out of stock products with an “Unavailable” label to prevent driving traffic to them. “DSA with page feeds helps us expand our audience reach and dramatically reduces operational overhead while maintaining targeting control at the URL level.” - Tomoyuki Ishii, Manager of Digital Marketing at Recruit Lifestyle Co., Ltd. Earlier this year, Search and Display campaigns fully transitioned to expanded text ads. Over the next month, we’re rolling out support within DSA campaigns for this expanded format. Longer headlines and description lines allow you to show more information about your business before people click your ad. When you create a new ad, use the expanded description field to provide deeper messaging that focuses on what consumers care about. It’s important that your ads only show when they’re most relevant to what people are searching for. For example, if you're a baker in Palm Springs, your ads should only show to people who are looking for baked goods in Palm Springs. That’s why we’re always improving the effectiveness of our DSA campaigns. With our latest updates, advertisers are seeing on average an increase in conversion rate and a decrease in CPA. Dynamic Search Ads (DSA) help you reach people who are searching for your products and services—without the need for you to actively manage keywords or ads. Today we're introducing three improvements to DSA: page feeds, expanded ads and quality enhancements. We know advertisers don't want their ads next to content that doesn’t align with their values. So starting today, we’re taking a tougher stance on hateful, offensive and derogatory content. This includes removing ads more effectively from content that is attacking or harassing people based on their race, religion, gender or similar categories. This change will enable us to take action, where appropriate, on a larger set of ads and sites. We’ll also tighten safeguards to ensure that ads show up only against legitimate creators in our YouTube Partner Program—as opposed to those who impersonate other channels or violate our community guidelines. Finally, we won’t stop at taking down ads. The YouTube team is taking a hard look at our existing community guidelines to determine what content is allowed on the platform—not just what content can be monetized. Every company has brand guidelines that inform where and when they want their ads to appear. We already offer some controls for advertisers that respond to these needs. In the coming days and months, we’re introducing new tools for advertisers to more easily and consistently manage where their ads appear across YouTube and the web. Safer default for brands. We’re changing the default settings for ads so that they show on content that meets a higher level of brand safety and excludes potentially objectionable content that advertisers may prefer not to advertise against. Brands can opt in to advertise on broader types of content if they choose. Simplified management of exclusions. We’ll introduce new account-level controls to make it easier for advertisers to exclude specific sites and channels from all of their AdWords for Video and Google Display Network campaigns, and manage brand safety settings across all their campaigns with a push of a button. More fine-tuned controls. In addition, we’ll introduce new controls to make it easier for brands to exclude higher risk content and fine-tune where they want their ads to appear. We’ll offer advertisers and agencies more transparency and visibility on where their ads are running, and in the coming months we’ll expand availability of video-level reporting to all advertisers. We'll be hiring significant numbers of people and developing new tools powered by our latest advancements in AI and machine learning to increase our capacity to review questionable content for advertising. In cases where advertisers find their ads were served where they shouldn’t have been, we plan to offer a new escalation path to make it easier for them to raise issues. In addition, we’ll soon be able to resolve these cases in less than a few hours. We believe the combination of these new policies and controls will significantly strengthen our ability to help advertisers reach audiences at scale, while respecting their values. We will continue to act swiftly to put these new policies and processes in place across our ad network and YouTube. But we also intend to act carefully, preserving the value we currently provide to advertisers, publishers and creators of all sizes. In the end, there’s nothing more important to Google than the trust we’ve built amongst our users, advertisers, creators and publishers. Brand safety is an ongoing commitment for us, and we’ll continue to listen to your feedback. The web has opened a door for new communities and platforms that help people find diverse views and have a voice. Today, anyone with a smartphone can be a content creator, app developer or entrepreneur. And Google has enabled millions of content creators and publishers to be heard, find an audience, earn a living, or even build a business. Much of this is made possible through advertising. Thousands of sites are added every day to our ad network, and more than 400 hours of video are uploaded to YouTube every minute. We have a responsibility to protect this vibrant, creative world—from emerging creators to established publishers—even when we don’t always agree with the views being expressed. But we also have a responsibility to our advertisers who help these publishers and creators thrive. We have strict policies that define where Google ads should appear, and in the vast majority of cases, our policies and tools work as intended. But at times we don’t get it right. Recently, we had a number of cases where brands’ ads appeared on content that was not aligned with their values. For this, we deeply apologize. We know that this is unacceptable to the advertisers and agencies who put their trust in us. That’s why we've been conducting an extensive review of our advertising policies and tools, and why we made a public commitment last week to put in place changes that would give brands more control over where their ads appear. I wanted to share that we've already begun ramping up changes around three areas: our ad policies, our enforcement of these policies and new controls for advertisers. If a million trees fall in the forest and nobody hears them, do they make a sound? What about a million impressions that are served but ignored? It’s important for advertisers to ensure their video ads don’t just reach their audience, but also capture their attention -- at scale. Today, I’m excited to announce new research and reporting features to help advertisers do just that. Reach is a critical measure of scale for advertisers. To help you know how many people you're connecting with, we are introducing Unique Reach in AdWords. This update allows you to see the number of unique users and average impressions-per-user across devices, screens and platforms. But mere exposure to advertising isn’t enough. In order to have real impact, ads must capture attention. And to maximize attention, you need to know that your audience has seen, heard and spent time with your ad. Source: Google TrueView Brand Lift studies Aug-Sep 2016, Global, data for users with single impression. Data shows ratio of additive differences vs. control respondents for each group of viewers. Finally, even with the assurance that your audience can see and hear your ad there still remains the lingering question of how much time they actually spent watching your content. To help provide advertisers with this critical layer of detail we’ll start reporting watch time for your in-stream and bumpers campaigns. Alongside viewability and audibility rates, watch time gives you another powerful signal for understanding how people view your ads. Now, by looking at watch time across your YouTube campaigns, you can get closer to understanding which ads are holding the attention of your viewers, and are thus most likely to make an impact. Driving business results in today’s media environment means prioritizing attention. On YouTube, advertisers are able to take that powerful combination of sight and sound, and scale it to over a billion users with the ability to better understand how many users you reached across screens and how much time they spent watching your ads. We’re excited to offer these metrics, which will be available shortly in AdWords. For more information, check out our Help Center articles on Unique Reach and watch time reporting. We have new updates coming soon across these areas to help you improve your calls performance. Account-level call extensions will begin rolling out this week to help you set up call extensions at scale. You can implement them once across your entire account rather than adding them multiple times to individual campaigns and ad groups. In the coming months, we're also rolling out automated call extensions to more advertisers globally to help you set up call extensions more quickly. 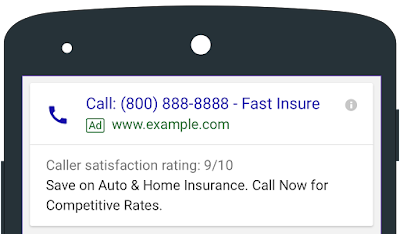 AdWords will identify landing pages that already feature a prominent phone number, and automatically set up a call extension and call reporting for this phone number to help you drive more calls to your business. In addition to making call extensions quicker to set up, we’re improving the ad experience to help consumers call you more easily. 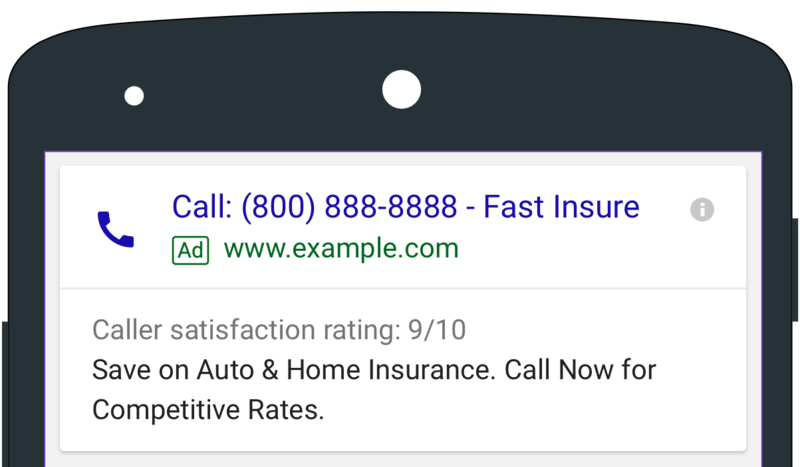 For example, we started testing business names in the headlines of call-only ads last year to help advertisers maximize high-quality calls from people who intend to call them. “Introducing business names to call-only ads has improved the quality of calls we drive from Google Search for clients across our agency. We’ve been able to showcase their brands more clearly and increase user trust, which has led to significantly higher clickthrough and call conversion rates." We’re now rolling this change out globally and will continue experimenting with other new features in click-to-call ads, including testing caller satisfaction ratings to show consumers which businesses are delivering a great user experience over the phone. Measuring performance from your click-to-call ads is essential for making informed decisions about your spend and optimizations. AdWords call reporting is easy to set up and available in 23 countries around the world at no additional cost to show you useful insights and conversions from the calls you’re receiving. We’ll soon be adding new call details to your keyword and ad copy reports. Additional columns for “Phone impressions” and “Phone calls” will give you a more complete view of call performance and help you see where there are opportunities to improve. For example, consider using call-only ads on keywords with the highest phone-through rates, or decreasing wait times when you have customers on the phone to improve call conversion rates. We hope these new updates to click-to-call setup, ad experiences and reporting will help you ring in 2017 with great calls performance. To learn more, visit the Help Center and read our best practices for driving phone calls to your business and optimizing the caller experience. There’s no better way for a new user to experience your game than to actually play it. 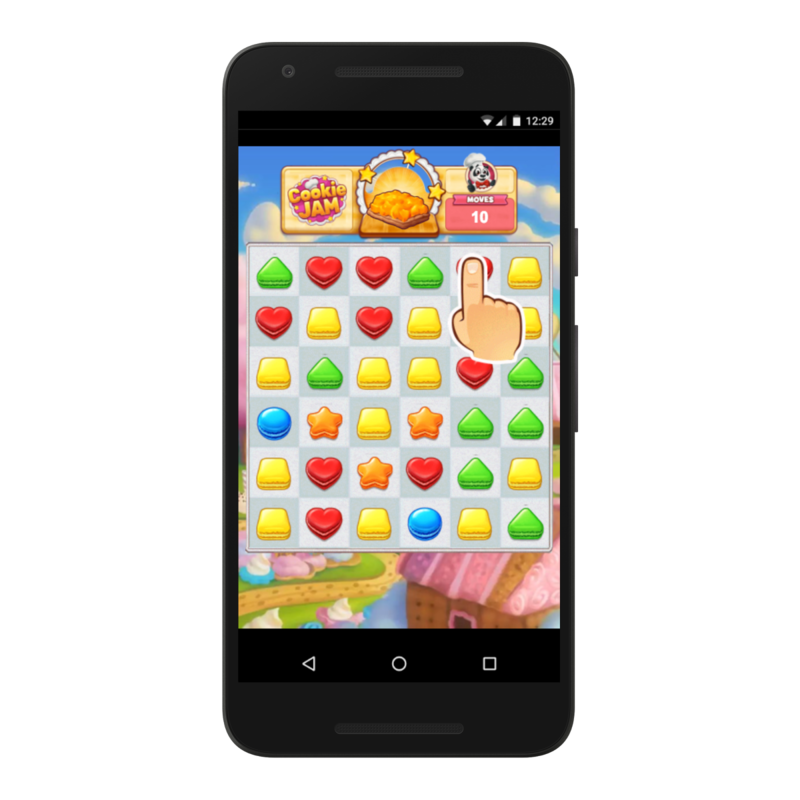 So today, we introduced playables, an interactive ad format in Universal App Campaigns that allows users to play a lightweight version of your game, right when they see it in any of the 1M+ apps in the Google Display Network. Playables help you get more qualified installs from users who tried your game in the ad and made the choice to download it for more play time. By attracting already-engaged users into your app, playables help you drive the long-term outcomes you care about — rounds played, levels beat, trophies won, purchases made and more. Playables will be available for developers through Universal App Campaigns in the coming months, and will be compatible with HTML5 creatives built through Google Web Designer or third-party agencies. 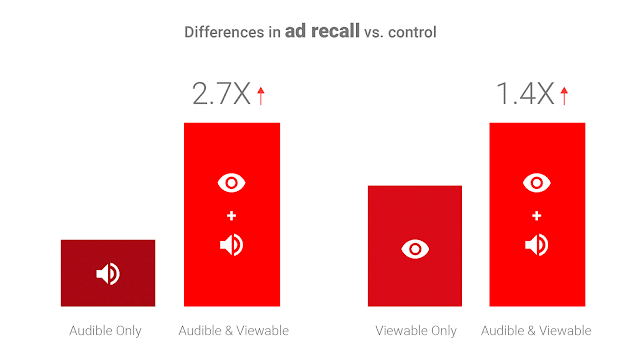 Most mobile video ad views on the Google Display Network are watched on devices held vertically.2 This can create a poor experience when users encounter video ad creatives built for horizontal viewing. Developers using Universal App Campaigns will soon be able to use an auto-flip feature that automatically orients your video ads to match the way users are holding their phones. If you upload a horizontal video creative in AdWords, we will automatically create a second, vertical version for you. Developers have embraced AdMob's platform to mediate rewarded video ads as a way to let users watch ads in exchange for an in-app reward. Today, we are delighted to announce that we are bringing Google’s video app install advertising demand from AdWords to AdMob, significantly increasing rewarded demand available to developers. Advertisers that use Universal App Campaigns can seamlessly reach this engaged, game-playing audience using your existing video creatives. We are also investing in better measurement tools for developers by bringing the power of Firebase Analytics to more game developers with a generally available C++ SDK and an SDK for Unity, a leading gaming engine. 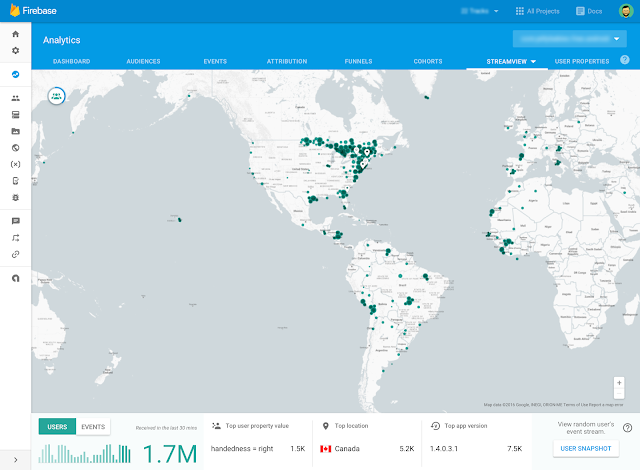 With Firebase Analytics, C++ and Unity, developers can now capture billions of daily events — like level completes and play time — to get more nuanced player insights and gain a deeper understanding of metrics like daily active users, average revenue per user and player lifetime value. This is an exciting time to be a game developer. It’s been a privilege to meet so many of you at GDC 2017 and learn about the amazing games that you’re all building. We hope the innovations we announced today help you grow long-term gaming businesses and we look forward to continuing on this journey with you.